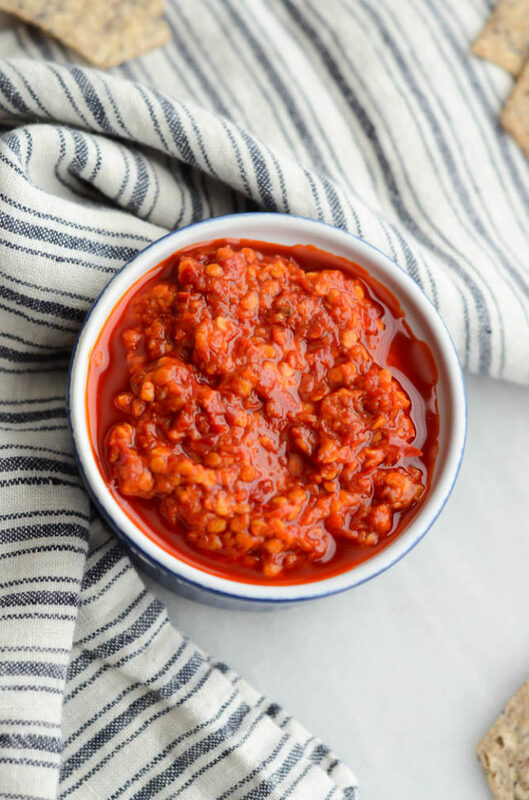 A ridiculously simple recipe for the best hot sauce/dressing/dip you’ll ever taste, this Calabrian chili sauce has only three ingredients! Today I’m all about keeping it quick, simple and super tasty. I’m currently running on just a few hours of sleep after catching the earliest flight possible back from Quebec City yesterday so I could make it to our annual Holiday Boat Parade. Quebec City was AMAZING and I am so excited to tell you all about it and show you all of the pictures. We snowshoed, spa-ed, visited the Christmas markets and froze our little tushies off (hello 14-degree weather!) Stay tuned for another Travel Diaries post soon. Even though I had the best time, because we only had five days there we were going the entire time, always on the move trying to squeeze everything in. 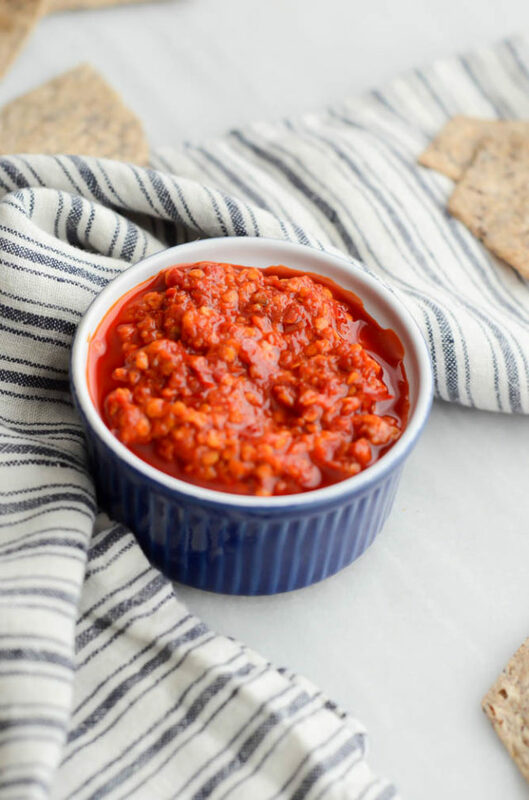 I can’t wait to sleep, sleep and sleep some more so, until then, about all the strength I can muster is to tell you about the deliciousness that is this Three-Ingredient Calabrian Chili Sauce. This recipe was inspired by a brunch the hubs and I had at SY Kitchen in Santa Ynez way back in June. We’re somewhat of hot sauce fiends, so naturally we asked for some to go with our eggs. Instead of the classic Tapatio or Tabasco, our waiter brought us a small bowl of a fiery red condiment and informed us that this was the only hot sauce they served there. We took one bite and immediately had to ask what the secret ingredient was. Turns out it was Calabrian chili peppers! I love Calabrian chili peppers because they are so much more than just a spicy pepper. They originated in Italy (no wonder they’re delicious) and have a whole other dimension than your average pepper. Your mouth isn’t just hit with a wave of heat, there’s actually flavor in there that makes you keep wanting to come back for more. After doing a little bit of research on how I could get my hands on some Calabrian chilies, I found that I could both order them on Amazon and also found them at the fantastic high-end grocery store where we stay when we go up to Napa. Although there are plenty of dried Calabrian chili options, I went for those packed in oil so I wouldn’t have to go through the extra step of rehydrating them before pureeing them into this tasty hot sauce. Of course, if you can only find the dried ones, simply soak them in some warm water for a few hours (or overnight) before using. The brand of Calabrian chilies packed in oil that I used still had the stems attached, so I simply cut those off when pulling them out of the jar. Aside from the chilies themselves, the only ingredients you’ll need for this easy recipe are some fresh olive oil and peeled, whole garlic cloves. I suppose you could use the oil that the chilies come packed in, but I thought it might make the spice just a bit too intense. If you REALLY don’t mind spicy, then I say go for it! 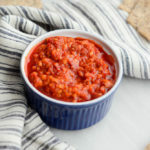 All you have to do to make this easy Three-Ingredient Calabrian Chili Sauce come to life is throw the above-mentioned ingredients in a food processor or high-powered blender and puree until that smooth, spreadable, aromatic paste forms. Once it’s made, the sauce will last for up to a month in the refrigerator and will turn into your go-to condiment for any breakfast, brunch, lunch or dinner that could use that extra-spicy kick. Now you have this delicious hot sauce in your hands and, the question is, how to use it? Some of my favorite uses include mixed into a healthy scramble, swiped on top of avocado toast or used as a dip for a special pizza. I’m going to keep this short today so I can continue recuperating from my travels, but trust me when I say you’ll be doing yourself a HUGE favor if you make this spicy Italian spread ASAP. Hot sauce lovers unite! 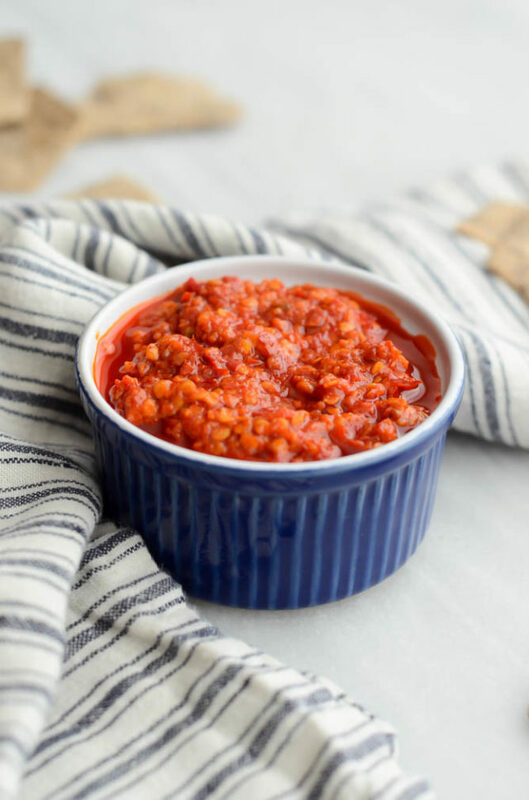 A ridiculously simple recipe for the best hot sauce/dressing/dip you'll ever taste, this Calabrian chili sauce has only three ingredients! Combine all three ingredients in a food processor or high-powered blender. Pulse until a smooth paste forms. Keep in a Tupperware or resealable glass jar for up to one month in the refrigerator. Gimme allll the hot sauce! I am making this using dried calabrian chilis, my question is do I seed the peppers or use the seeds in the paste? Hi Melissa – Go ahead and use the seeds! Let me know how it turns out with the dried chilies!